First off, I want to say that I think I’ve finally acclimated to being out here in high elevation! I am feeling more energized and like my regular self. I do wonder if it’s an illusion because today was mostly relaxed. We’ll really test the theory when we are back off trail and cross country tomorrow. Today was trail day! 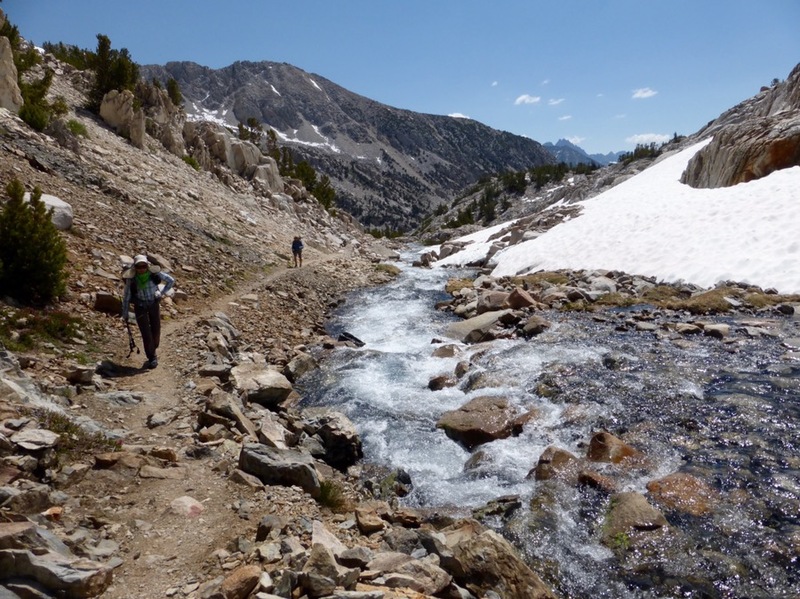 Some people who do the Sierra High Route really get frustrated when it has its short periods where it overlaps with the John Muir Trail. I have really welcomed it so far to get a mental and physical break from the off trail stuff. 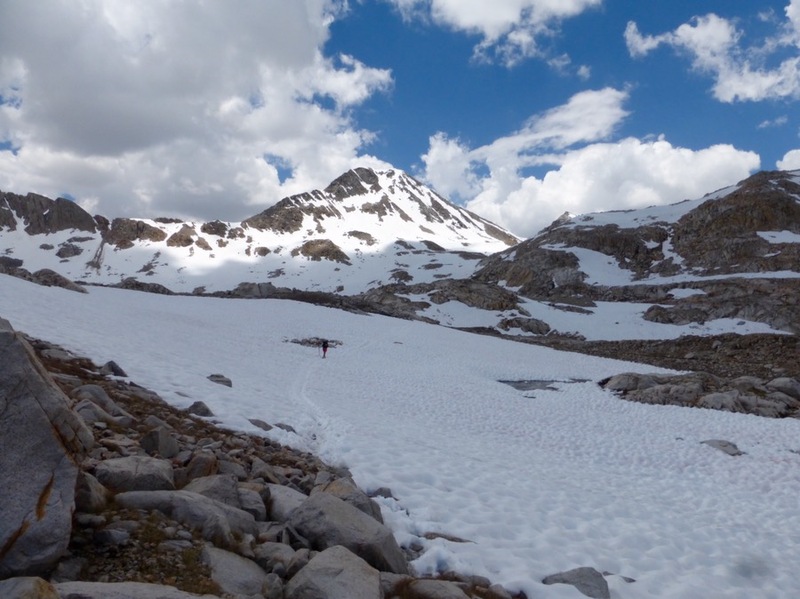 We had it happen for 5mi last week at Mather Pass and today is a whopping 15mi section from LeConte Canyon, over Muir Pass, through Evolution Basin, and stops just before entering Evolution Valley. 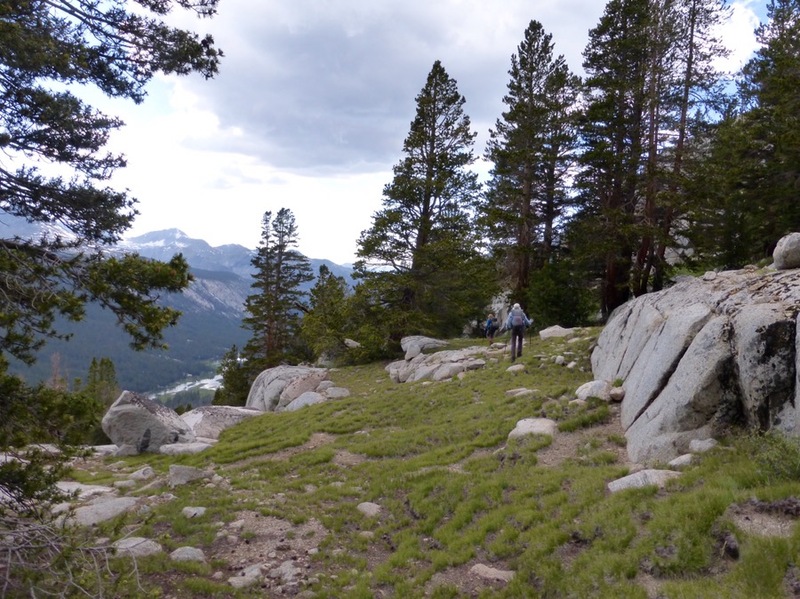 Yes, a really great section of the JMT! We got our usual 6am start and first had 4mi to go doowwnn the Bishop Pass Trail to LeConte Canyon. It was pretty great to cruise and listen to music. Rockin’ at the top of the descent to LeConte Canyon (seen left). Morning light hitting the mountains on the way down. 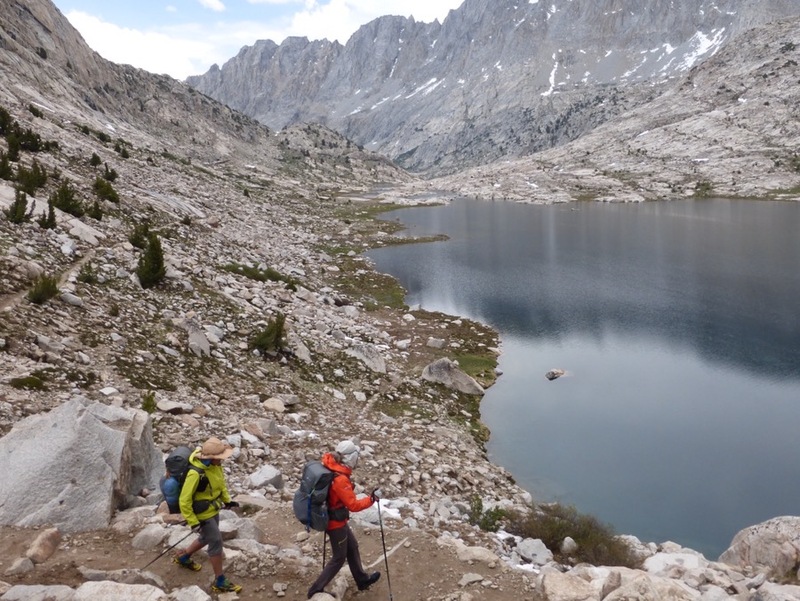 Once in LeConte Canyon, we were on the JMT/PCT for 15mi, wahoo! 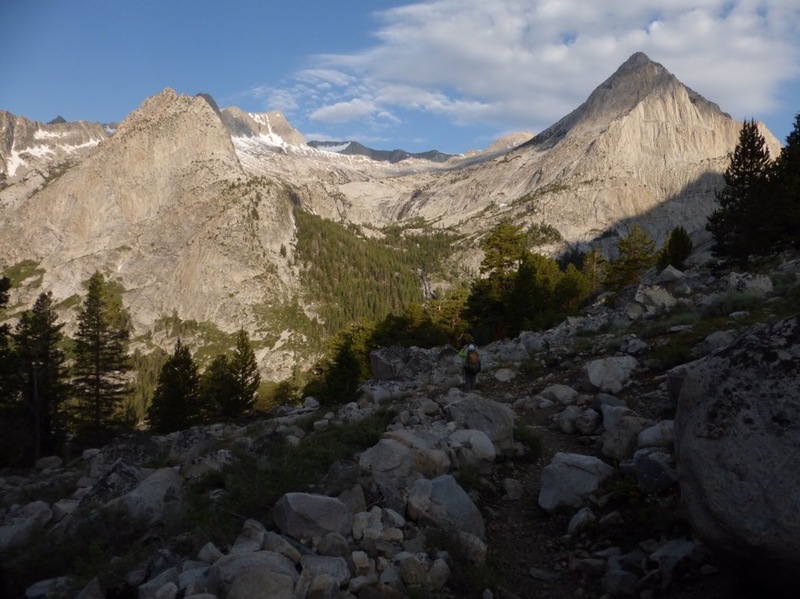 LeConte Canyon on the JMT. We got to the rock monster and had to take some photos. 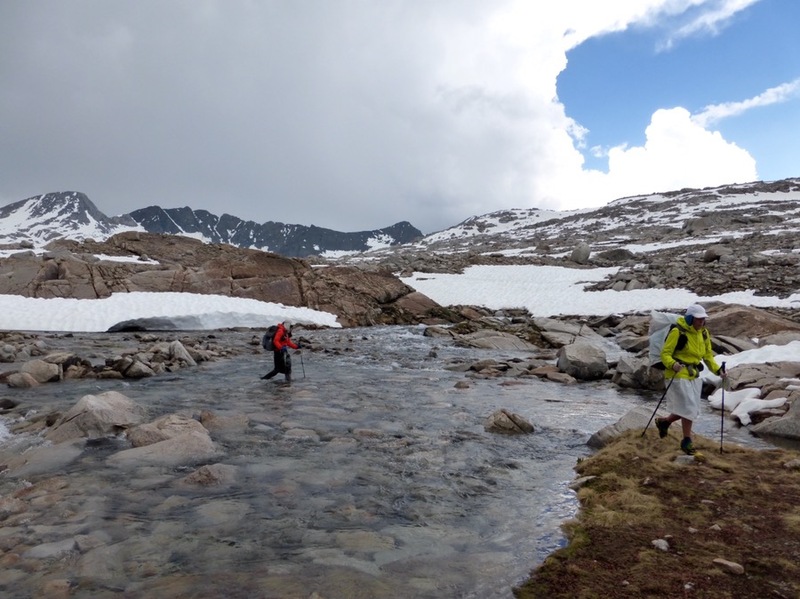 We leapfrogged with some PCTers up to Muir Pass. One woman was in front of me and I asked her her trail name. She said it was Wing-It and I told her I had a Wing-It on trail when I did the PCT in 2011. It was the same Wing-It ha! Small world. Myself and Wing-It who also did some of the PCT in 2011. Two of the PCTers had seen my blog, so that’s cool. 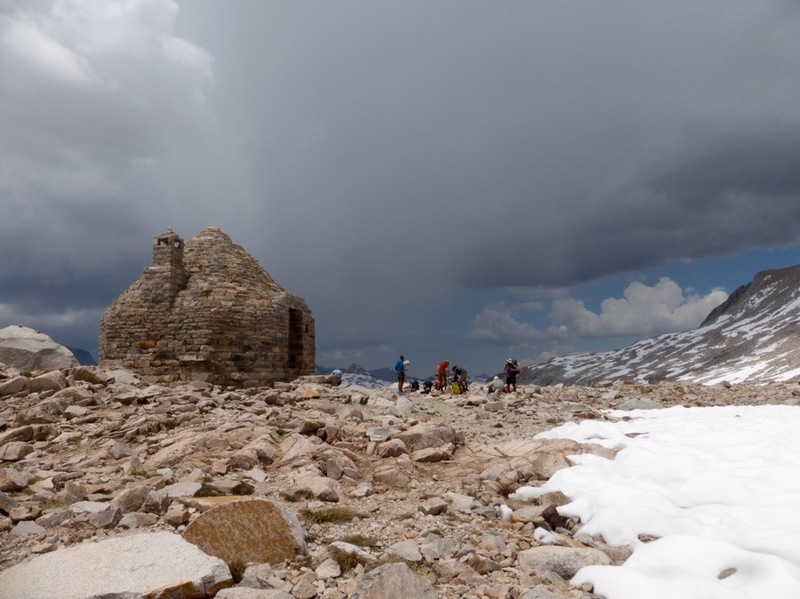 We all made it up to the Muir Hut around 1pm as storm clouds gathered and thunder rolled. There were stretches of snow coming up the south side of Muir, but the north side was predominantly snow. 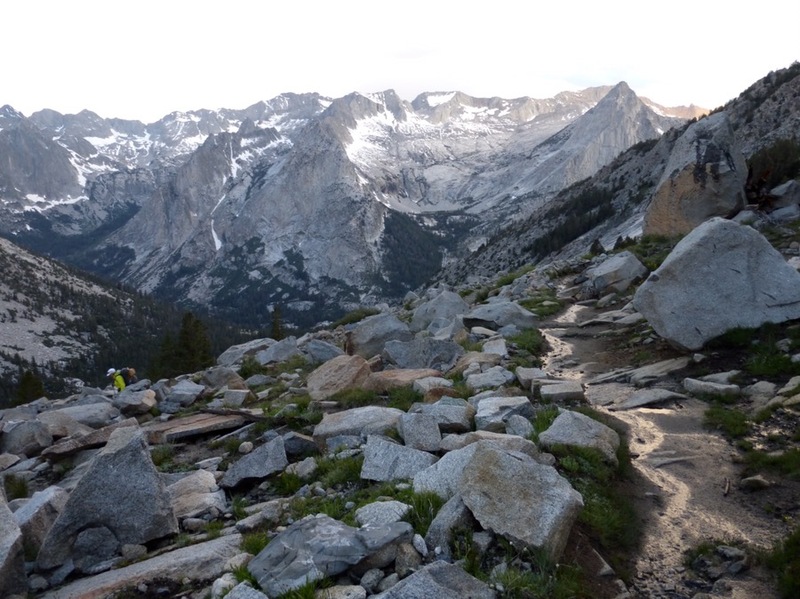 Plenty of run-off and overflowing streams as we hiked up to Muir Pass. 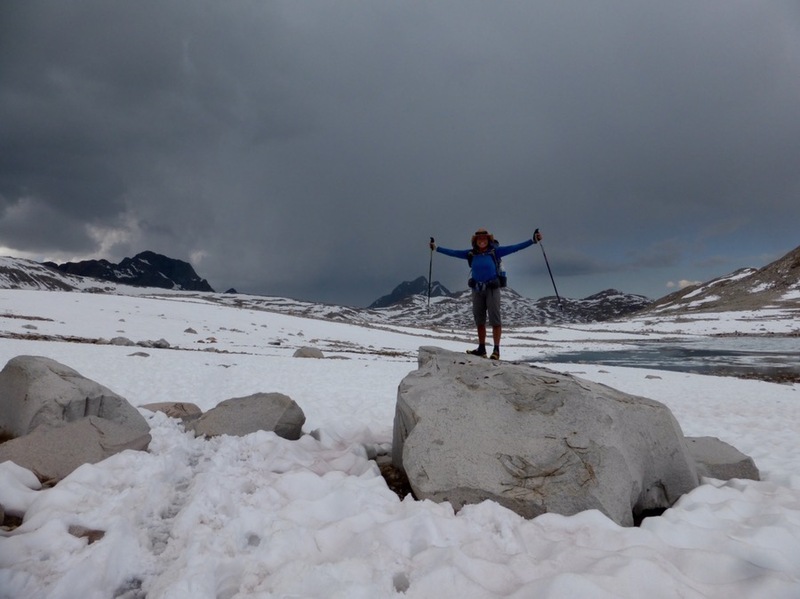 Snow as we ascend Muir Pass. 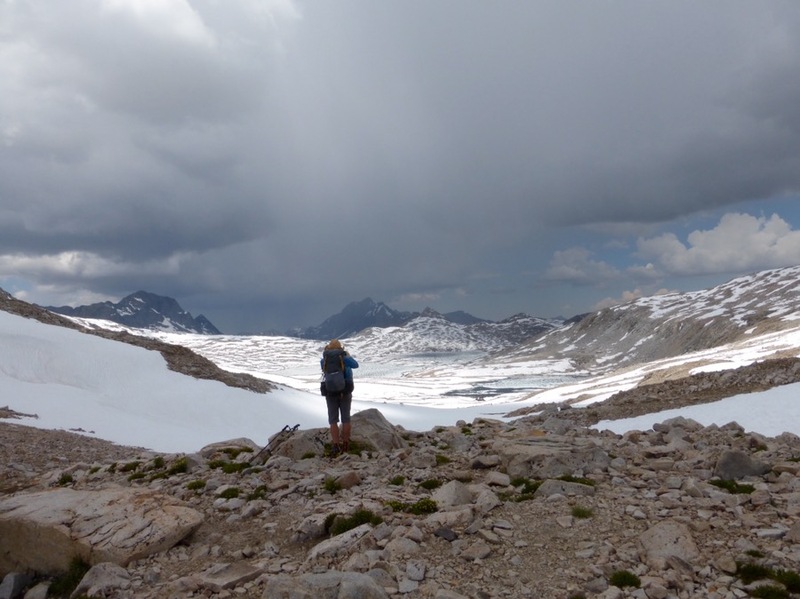 Top of Muir Pass with storm clouds. It rained and thunder rumbled for an hour as we made our way down. That’s twice in two days I put the umbrella to use and I’ve been using it often to shield from the sun while hiking and at lunch. Rockin’ looking north from Muir Pass. 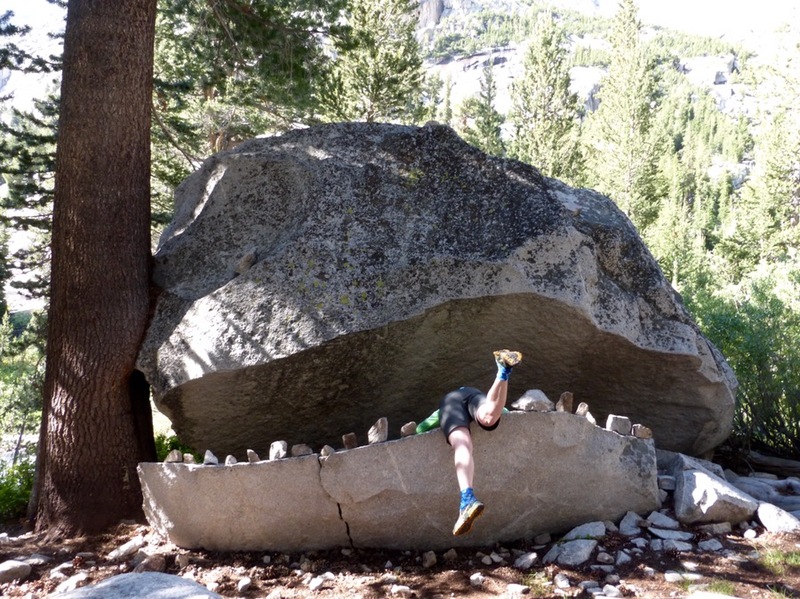 At the bottom of Muir Pass is the rock that inspired the name of Rockin’s blog, Lady On A Rock. Years ago, Rockin’ saw an older woman that was section hiking the PCT sitting on that rock. That’s the first time she ever heard of thru-hiking or a woman going out there solo. The rest is history! What’s really cool is that years later, through a follower on my blog, Rockin’ was connected with the woman who she saw years ago sitting on that rock. 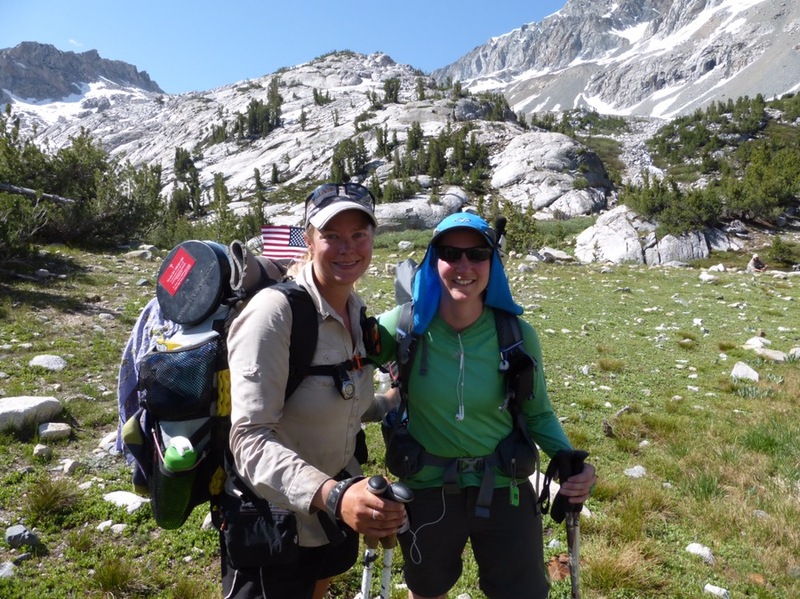 Also, last summer, we found out that a thru-hiking friend of mine was inspired to thru-hike when she met the same woman in Northern California on the PCT. What a wonderful world! Rockin’ on the Lady On A Rock rock. 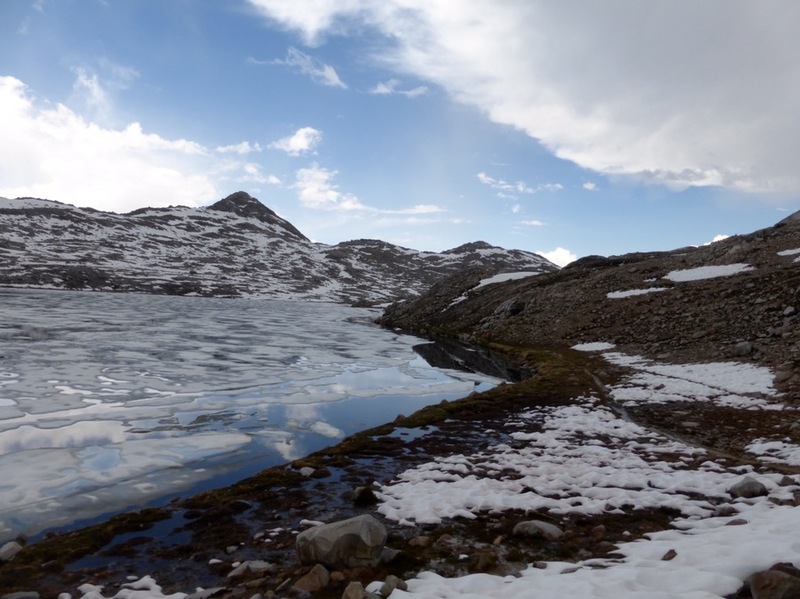 We cruised the rest of the afternoon on the JMT passing through the pretty awesome, lake-filled, Evolution Basin. Countless wide stream crossings today. 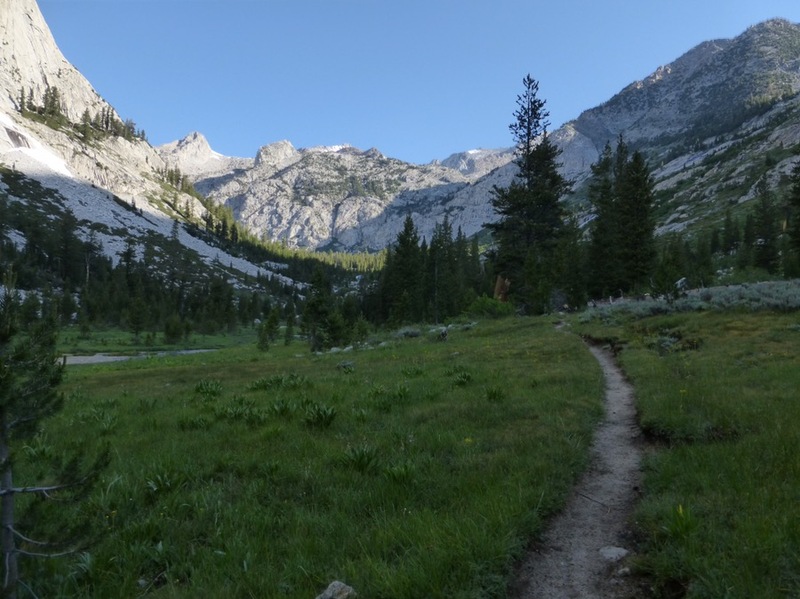 At the end of the day, we forked off the JMT, and back to the cross country of the SHR. We came off the JMT just before it dropped into Evolution Valley. Our directions were to just contour along some benches at a certain elevation for 3mi. Nice bench walking. Notice Evolution Valley on the left way below. We stopped at 6:15 after 2mi of the cross country near a stream and a nice level spot to pitch the tents. We would have liked to get higher for the best view, but it had been a long day with really heavy packs. This will probably be our biggest mile day on the SHR. Erin I was wondering what the night and day temperature range has been so far on the SHR? Do you carry a small thermometer or does you Iphone have a temperature sensor? You and your partners don’t seem to need to wear your down hoodies so far. I have a mini thermometer that seems to read well and we can guess pretty well at this point. It’s been very warm compared to regular. We wear the down for about 30mins or so of hiking in the AM until we warm up and a night at camp. Yes, my previous experience is that it’s much much colder at night. Seems to be getting cooler the last couple of days, but I’d say the coldest has been upper 30s overnight. Awesome about THE Rock, too.. and that Rockin got good meds to help her feel her normal self, which gave you some rest time too. Love that rock monster! 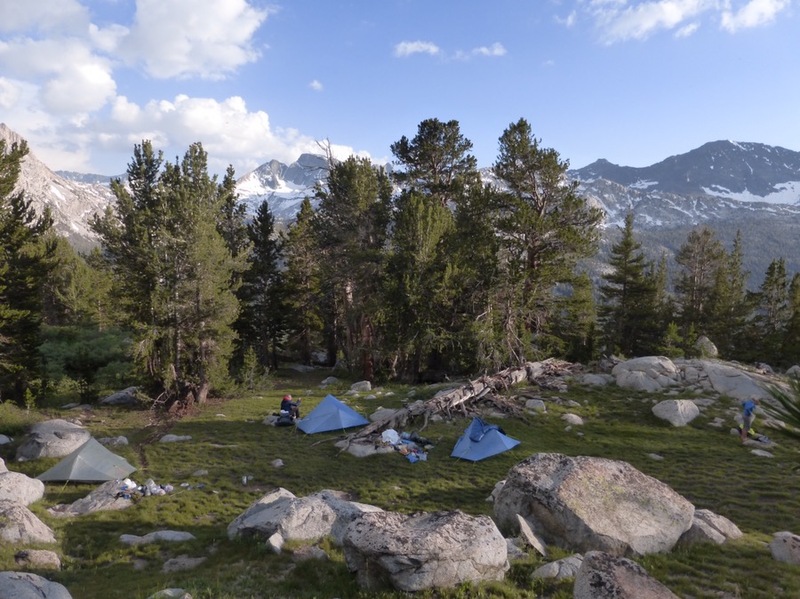 Camped there on my PCT section a couple of years ago. You went through some of the most beautiful country I can think of today!! Beautiful terrain on your Trail Day. Good for you. Like the Rock Monster too! Way to have a bit of fun on the trail.